The president of the taxpayer-funded University of Michigan, Mark Schlissel, wrote in an email that he found it “ironic” when students who supported Donald Trump felt “marginalized and ostracized” on campus after the 2016 presidential election. A few months earlier, Schlissel wrote in another email that he “would feel awful if Trump won the election” and seemed to suggest that he wanted to use his taxpayer-funded job to defeat Trump. Schlissel then refused to release the emails — and others — in which he disparaged Trump and Trump’s supporters. On Wednesday, the Mackinac Center for Public Policy reached a settlement over the University of Michigan’s refusal to release the emails. The Michigan free-market group had sued the public school in March. In the settlement, the Michigan officials agreed to release Schlissel’s emails they had previously withheld in response to the Mackinac Center’s Freedom of Information Act (FOIA) request. 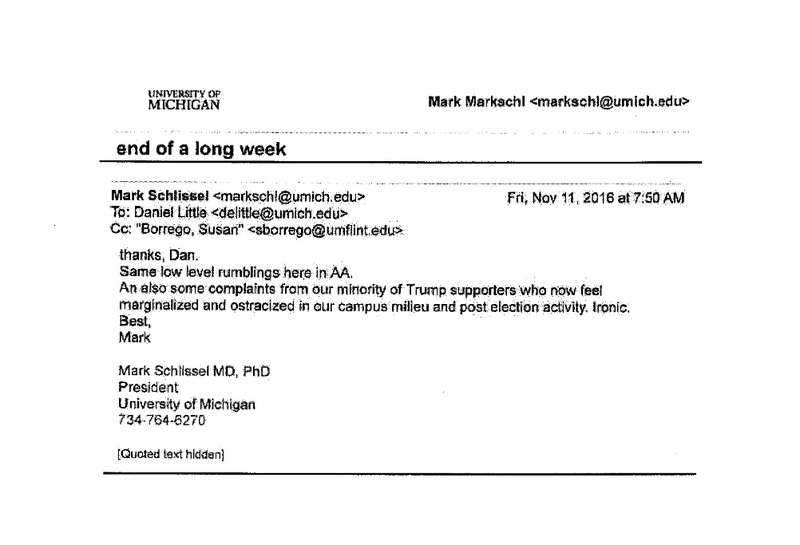 In a Nov. 10 email to Mary Sue Coleman, Schlissel predecessor as Michigan president, Schlissel said he was “overwhelmed with uncertainty” because Trump won the election. “Students rallied on the Diag yesterday night and the speakers all expressed fear about their place in American society and on campus. I was only able to reassure them about the latter,” Schlissel wrote. In the immediate aftermath of Trump’s 2016 presidential election victory, the University of Michigan hosted several events for students who were upset that Trump had won the election. 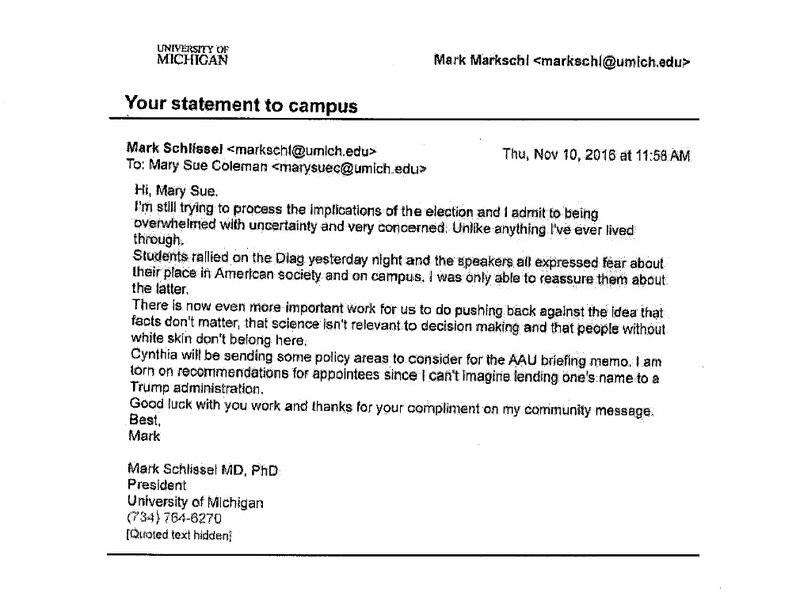 Schissel also plainly and unmistakably implied that Trump and Trump supporters oppose science and believe only white people should attend the University of Michigan. 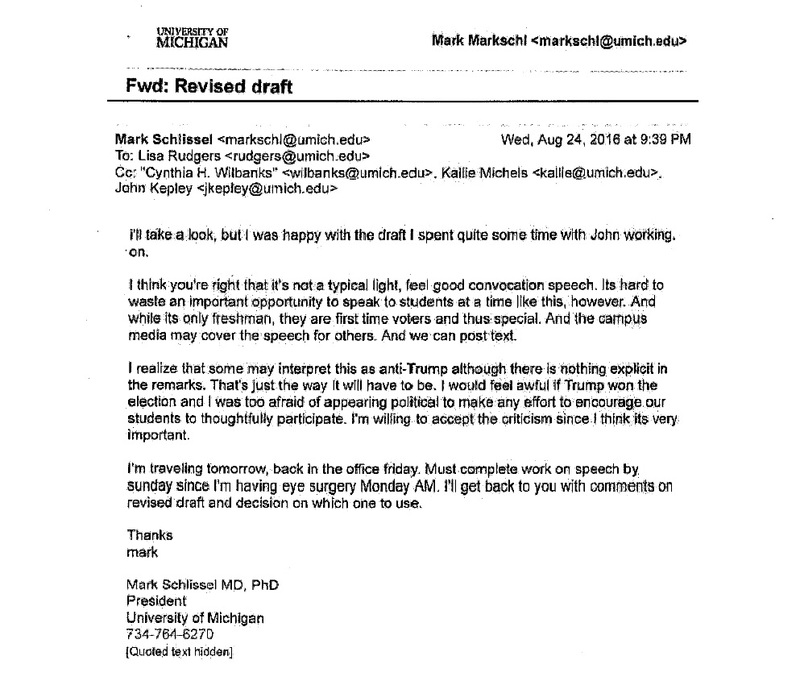 In an Aug. 24 email, prior to the election, Schlissel wrote that he “would feel awful if Trump won the election” and he seemed to suggest that wanted to do things from his taxpayer-funded position to affect the election. “I would feel awful if Trump won the election and I was too afraid of appearing political to make any effort to encourage our students to thoughtfully participate,” Schlissel wrote. The Mackinac Center notes that Schlissel is a public employee and that the University of Michigan collects more than $1 billion each year in taxpayer funds from the federal government and the state of Michigan. 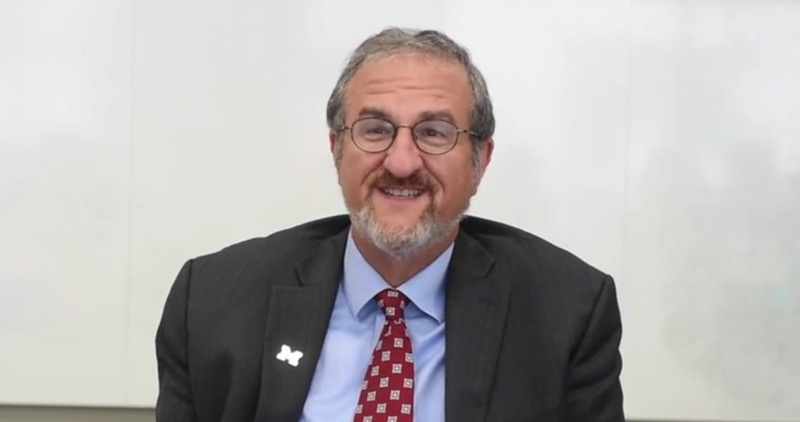 Schlissel is the fourth-highest paid employee on the University of Michigan’s campus in Ann Arbor. As of 2015, his salary was $772,000 per year, reports The Michigan Daily. In addition to releasing the unreleased emails, the University of Michigan also agreed to change its policies concerning FOIA requests as part of the settlement. The new policies will make obtaining information easier for taxpayers and the press. “People and the press have a right to this information, even if it’s embarrassing or inconvenient for the public officials involved,” Wright said. The Mackinac Center noted that school officials said they needed less than three hours to gather the information they had been withholding. An especially silly election-related event occurred at the ostensibly prestigious University of Michigan Law School. After Trump won, staffers scheduled — then hastily canceled – an event entitled “Post-election Self-care with Food and Play.” The University of Michigan Law School’s embedded psychologist, Reena Sheth, was going to host of the event. Trump eked out a victory in the state of Michigan in 2016. He won the state’s 16 electoral votes by receiving just 10,704 more votes than Hillary Clinton received.